When United States Under-20 coach Tab Ramos gathered his players together after he selected his roster for the FIFA Under-20 World Cup earlier this year, he made a careful point to place the challenges ahead in perspective. As he recalls now, in the wake of reaching the quarterfinals in Korea Republic last month, Ramos said he congratulated his players for making the team and outlined the responsibilities created by their own hard work and facilitated by players who did not make the trip with them. Although Ramos pared his squad down to 21 for the tournament, he named other players for the CONCACAF Under-20 Championship and navigated through the entire process without some who might have otherwise featured. The best U-20 player in the program, Borussia Dortmund midfielder and emerging U.S. National Team star Christian Pulisic, did not feature at all due to his other commitments. Other players missed out because their European-based clubs did not release them to participate. One of the key midfielders, Gedion Zelalem, played less than a half before picking up an injury to rule him out of the tournament. Influential defender Cameron Carter-Vickers only played during the tournament itself. Current U.S. MNT and Borussia Dortmund star Christian Pulisic in his early years with DA club PA Classics. Even with those availability issues, the U-20s survived and thrived because they boasted the depth to cope with the absences. They leaned on a 17-year-old forward who emerged during the CONCACAF Under-17 Championship as a potential option for this group and turned out for a St. Louis Scott Gallagher Soccer Club when he wasn't scoring for fun with his country. They trusted players who developed with New York Red Bulls, Philadelphia Union, Real Salt Lake and Sporting Kansas City to form the spine of the team. They formed a pool deep enough to pick two competitive teams, albeit ones with different characteristics and qualities, according to Ramos. "There are a lot more players to choose," Ramos explains. "There are good players who don't make it. It opens the options for us. … We could have never had this conversation two cycles ago. The results create awareness." Those achievements also reinforce the importance and the success of a program started 10 years ago to shepherd players through the youth ranks and into the senior National Team. The proof is in the numbers: 17 of the 21 players in Korea Republic featured at one point in the U.S. Soccer Development Academy. The influence and the presence of those players - and the corresponding success in the Youth National Team Program over the past few years - at the highest levels underscores the vital strides made to create a streamlined and viable pathway from the club through the National Team system over the past decade. The creation of the road now commonly known as the Development Academy emerged after a measured evaluation of a particularly convoluted soccer landscape. Youth soccer in the United States emerged organically in a complex, unique fashion designed to fill a void left by the absence of development driven by professional clubs. Cities and towns offered a chance for any player with a ball and the desire to play. Clubs and leagues sprouted up to provide opportunities for players. Colleges and high schools fielded teams for their students. The widespread interest fostered a boom in participation over the past 30 years, but it muddled the way for the best players to emerge from the pack. The patchwork system did not offer a clear way forward. The best players bounced from club to club, team to team, tournament to tournament in search of insightful coaches and meaningful games. Some talented players navigated their way through. Many didn't. Others never even hit the radar for one reason or another. U.S. Soccer Director of Talent Identification Tony Lepore and U-17 head coach John Hackworth. 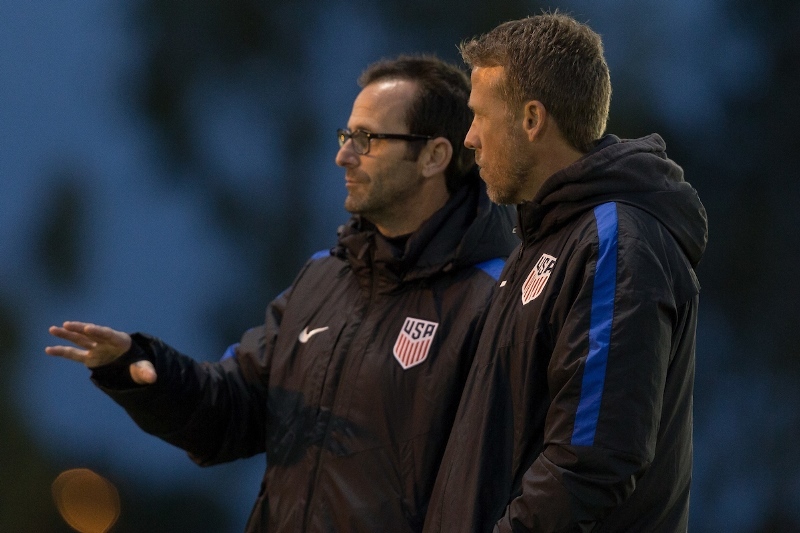 U.S. Soccer Director of Talent Identification Tony Lepore illustrates the impact of those demands with one anecdote from his time as an assistant with the U-15 Boys' National Team before the start of the Development Academy. Lepore participated in a larger evaluation camp one August where hopeful players assembled in a bid to stake their claim for a continued place in the pool. The players were excited and eager to impress, but they faltered physically and mentally during the first couple of days. In an attempt to figure out the root cause of the problem and set up a schedule to allow them to show their best, the staffers asked all of the players to fill out a survey. "In the end - and I'm going to approximate here - we asked them how many games they had played this year and we walked them through that process," Lepore said. "The average was somewhere between 100 and 110 games in one year. And not just with one team or one club, but with many different ones. And when we compared this to the number of training sessions, they were all playing in way more games than actual training sessions. The games to training ratio was totally backwards for optimal player development. And we knew at that time the map for a top player or pathway to the National Team was like a bowl of spaghetti. We actually drew it with arrows [to connect all of the disparate points]." The player pathway map to the U.S. National Team, before the Development Academy began in the fall of 2007. In order to create a more cohesive route through the program, U.S. Soccer gathered support to establish the Development Academy in 2007. The fundamental concepts - a focus on more high-quality training sessions to foster improvement and replace many of those games, a mandate to meet certain established technical criteria to ensure quality control and a willingness to pare down the schedule to around 30 games per year and reduce the focus on results - represented a massive shift in the market and required significant time to influence clubs to join the fledgling concept. "There were so many people in U.S. Soccer who were working on this so hard," U.S. U-17 coach John Hackworth said. "For example, I know that [U.S. Soccer General Secretary and CEO] Dan Flynn and [U.S. Soccer President] Sunil Gulati had to have so many conversations just to get the constituents and the membership of U.S. Soccer aligned to support it in the early days. From a technical side, there were just so many conversations that had to happen with clubs that were willing to take that leap of faith, who were willing to join." Ramos found himself in the middle of those discussions after he founded NJSA 04 in his native New Jersey and steered the club to title after title. NJSA 04 applied for inclusion after the initial wave of 64 clubs founded the Development Academy in 2007 and joined in time for the 2009-2010 season. Even at that point, the current U.S. Soccer Youth Technical Director said the possibility of providing a better experience for his players compelled the jump to the Development Academy. "At the time, I had already taken part of the craziness that youth soccer was throughout the country," Ramos said "Although my club had won everything there was to win, I felt that the environment we provided had to be better and the environment of the clubs we played against had to be much better. The DA offered the possibility of competing at the highest level but held clubs accountable to follow certain standards of training and playing. The DA provided actual opportunities for players to improve not to just win trophies or ridiculous ranking points. It was completely player-centered." At its core, the Development Academy exists to develop players and provide a pathway to shepherd them through the National Team system. Collective achievements and Development Academy titles are still important pursuits, but the foundation remains the consistency of the day-in, day-out work over the 10-month campaign. The effects of the program rest on the importance of those training sessions week after week, the reinforcement of one or two competitive games at the weekend, the strides made from a technical perspective to nurture players in possession, and the willingness to find new ways to prod the best prospects forward by providing different challenges along the way. "It has been a massive component to the improvement of our players," Ramos said. "Players are spending many more hours on the field with or around the ball." The information gathered during the past decade led to tweaks along the way to accelerate and encourage development. The continued expansion to new clubs (165 in the 2016-17 season) broadened the geographic reach and scope of the program. The evolving and improving coaching standards guaranteed continued alignment and improvement on the technical side. The addition of an under-14 division (2013), the subsequent split into single age under-13 and under-14 divisions (2015) and the unveiling of an under-12 program (2016) expanded the reach to those critical younger age groups. The impending arrival of a Girls' Development Academy this fall supplies a chance to exert similar effects on the women's landscape in the years ahead. 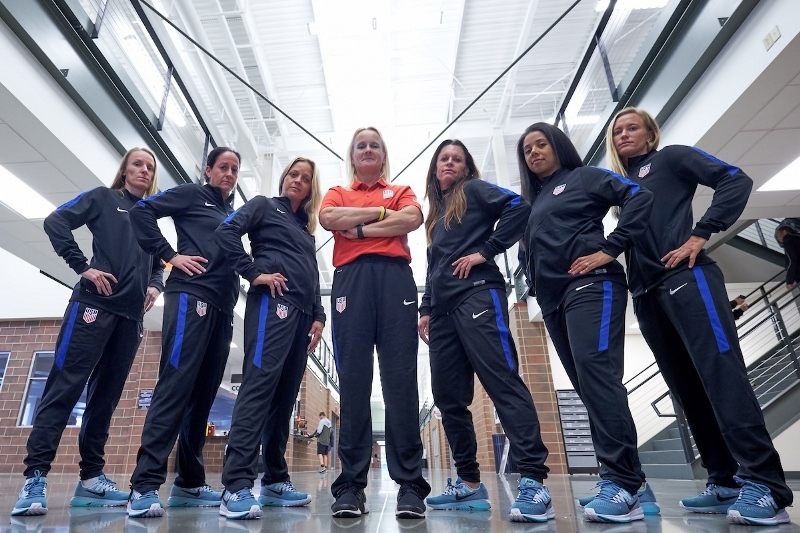 The Technical Staff of the inaugural Girls' Development Academy season, which begins August 2017. Those efforts - combined with the investment of resources and time from the clubs - continue to push the Development Academy forward even as it evaluates how to accelerate and sustain the progress in the coming years. "It's not just about the structure and the standards, it's also about empowering and supporting the clubs" Lepore said. "What our clubs and the Federation together have done is keep looking to raise the level. Every time we take a step, we raise the bar again. And the clubs are right there with us, and our top academies taking ownership of their improvement process." 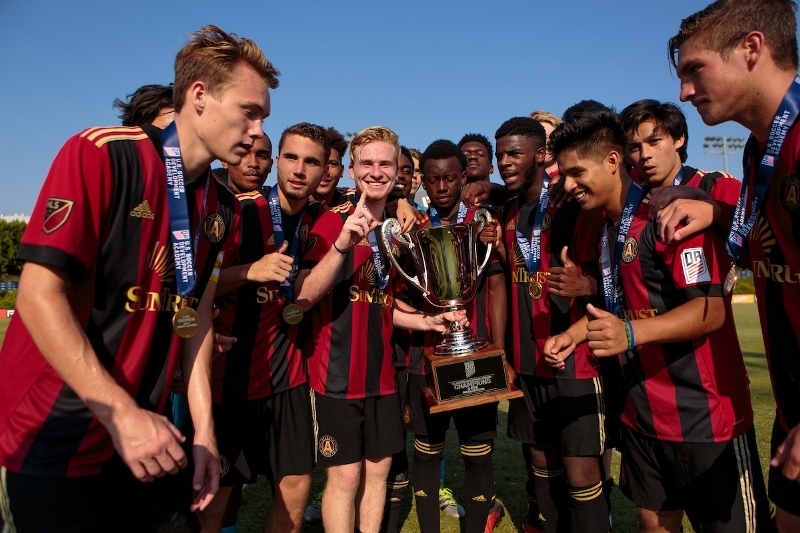 When Hackworth returned as U.S. U-17 coach after spending four years with Philadelphia Union's first team in 2015, he noticed the impact of the Development Academy setup on the options at his disposal straightaway. Instead of surveying a narrow band of players for inclusion in his team, he found himself running the rule over five, six or seven players at every position. The base level of the top Development Academy players - plus the introduction of selected prospects from outside the structure as they were identified by Training Centers or nurtured by capable clubs and teams outside the Development Academy structure - raises the level of competition across the board. "When you have that much depth in a player pool and you have a natural maturation that happens from player to player, that's what has really excited me about the future," Hackworth said. "Now I can tell that this is working. The player pool is better. The quality is better. The depth is significantly better. And that's the thing I look at and say, there's no question that this is the right way to go." Zyen Jones (inside row, second from right) among their ranks. The composition of the player pool across the board and results in Korea Republic and elsewhere offers proof to vindicate the claims. Ninety percent of U.S. Youth National Team players feature somewhere in the Development Academy system. 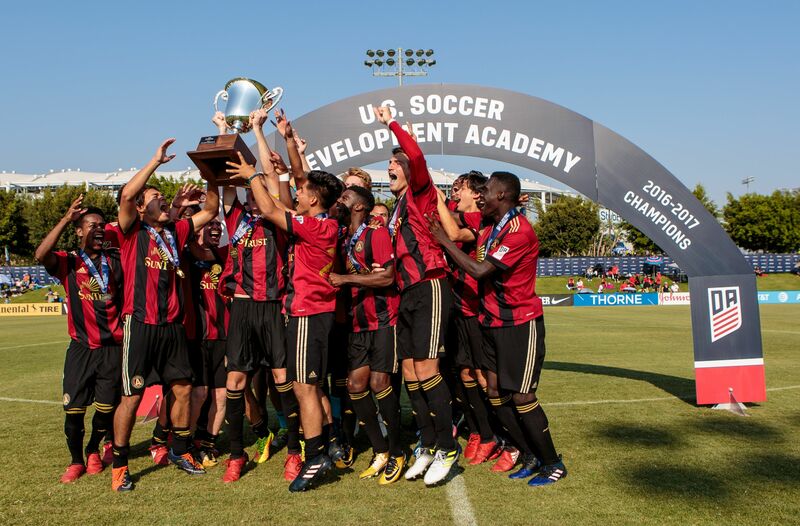 Those players constitute the bedrock for an undefeated 2016 U-18 team, loom as a critical component for the U-17 group headed to FIFA U-17 World Cup in October and present the options for a National Team Program with competitive teams in single age groups. At the apex, these players even make the step up to professional clubs and the U.S. National Team (including nine players with Development Academy ties on the U.S. roster for the CONCACAF Gold Cup). The initial returns over the first 10 years offer encouragement about the next 10 years ahead as the Development Academy continues to mature. The structure is firmly in place and the benefits are starting to manifest, but the job isn't done yet. There are further advancements to make, and many more players to develop, to propel U.S. Soccer towards its ultimate objectives of developing world class players to succeed at the highest levels of the game. "We have to keep pushing," Ramos said. "The players can continue to get better. We have a good start. We can't rest on our laurels. There's a lot of work we still have to do."